39/D being rescued on July 13, 2016. Photo by Bonni Myszka. Ospreys are in the news again. This time it is not so pleasant news, or at least news that is hard to swallow for some, where an adult bald eagle predated a young osprey at Hog Island in Bremen, Maine. While it can be a traumatic thing to witness firsthand, it is pretty common where the range of ospreys and bald eagles overlap. We are only witnessing it because of technology. It can and has happened right here in New Jersey too. Last year, I found an adult female who had lost her wing. With no other way for that to happen (on the open saltmarsh, and her wing was gone), the only suspect is an attack by a bald eagle. As both the eagle and osprey population continue to grow, there will only be more interaction between the two species as they are competitors for food and bald eagles are opportunistic scavengers. In other more local osprey news, on the afternoon of July 25th I got the most unfortunate news. Osprey 39/D was found dead near the nest where he fledged just two weeks ago. If you are not familiar with this bird, it is one who has graced the pages of the Asbury Park Press, The Sandpaper, and many other news networks online. His daring rescue was viewed over 2,800 times. The backstory: On July 12, he was observed and reported to be entangled in a net by a local photographer. 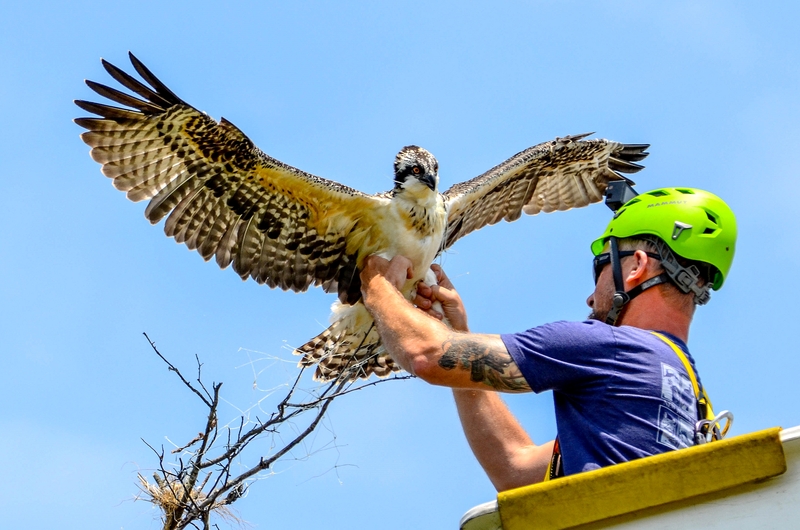 Being tied down to the nest, a plan was made to free the young osprey. 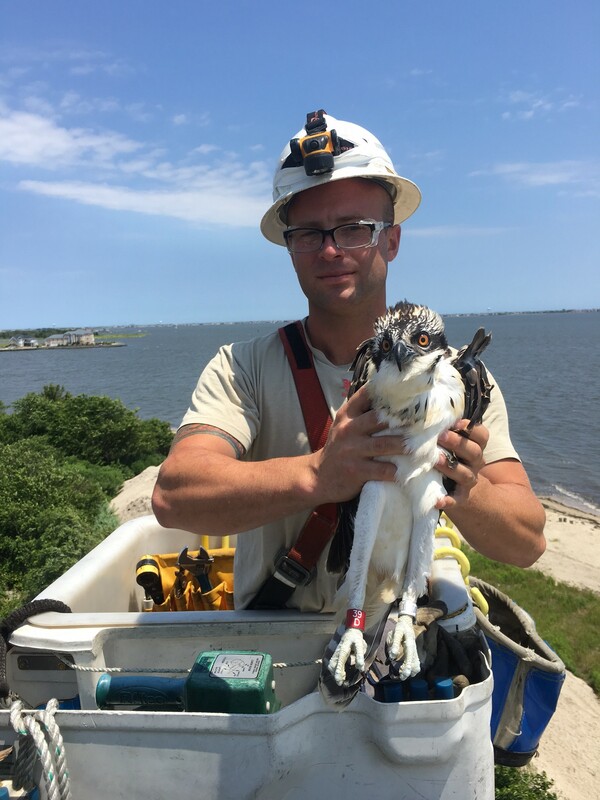 The next day, on July 13, he was rescued and the heart pounding effort was a great cooperative success between local Osprey Nest Watchers, CWF, and JCP&L. You can watch it all unfold on Conserve Wildlife’s Blog. Sadly, 39/D was lost to a common cause of death for many large birds – electrocution. He was identified by his red auxiliary band (39/D), and recovered underneath of a utility pole that was at the end of Allen Rd., in Berkeley Shores, and only 700′ from his nest. Each year we get reports of several ospreys, adults and young, that get electrocuted. 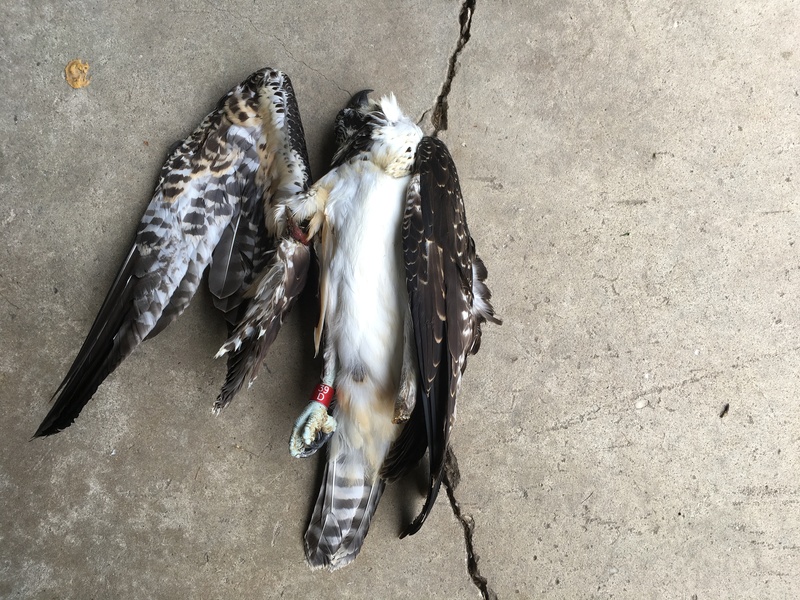 We all need electricity to live in today’s technological world, so preventing this from happening throughout the range of ospreys in New Jersey would be really hard and very expensive… However, electrocutions that are reported usually get swift action from the utility companies. They do not want to injure or kill ospreys or other birds of prey. Since this nest is within JCP&L service territory, we notified them immediately afterwards about the incident and they were saddened to hear this news. We are hopeful that JCP&L will make the needed modifications to this pole, and any others in their service territory that might pose a threat to any migratory birds, especially birds of prey, like ospreys, bald eagles, and vultures who have a large wing span. Many power companies are members of the Avian Power Line Interaction Committee and implement an Avian Protection Plan to mitigate for these types of situations where birds collide with wires or get electrocuted by electrical equipment. 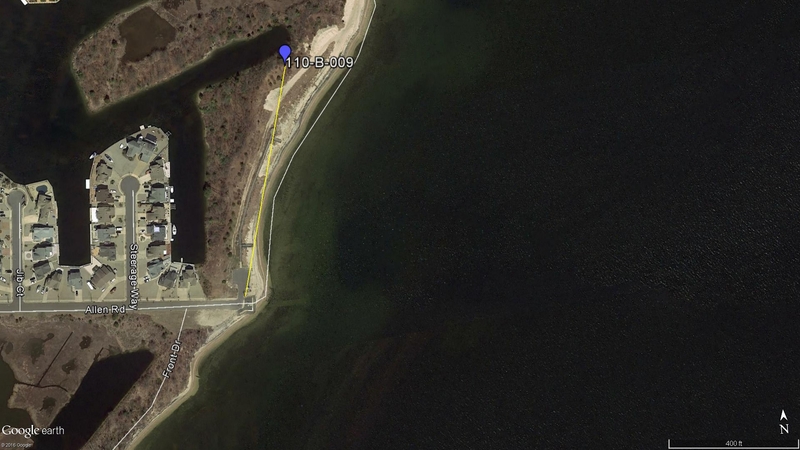 A map showing the osprey nest where 39/D originated from and where he was electrocuted. We are sad that 39/D did not survive to live a full life. Ospreys, especially young birds, have very high mortality rates during their first year of life. Around 50% of ospreys have a chance of surviving to adulthood. He lived long enough to experience flight and his death will help ensure that JCP&L steps up to help prevent this from happening at this site and others throughout their service territory. You can help by reporting a migratory bird that is injured by a power line or utility pole. Take a photo of the bird, the pole and write down the pole #. Please report to your electric utility company. We are happy to help if you need assistance. This entry was posted on Thursday, August 4th, 2016 at 3:19 pm	and is filed under osprey, Raptors, Wildlife News. You can follow any responses to this entry through the RSS 2.0 feed. Both comments and pings are currently closed. Poor 39D…Sorry Ben.I am glad I had the chance to see and photograph 39D four days prior to this. Makes me very sad. I didn’t know this happened. Ben, I too am glad I had a chance to see 39D prior to his death. This is such a tragedy. RIP 39D.